I wanted to share some of my thoughts regarding my current handling issues with the RX-8. For those that have not been following the past few races, I've been experiencing some odd behavior with the car. 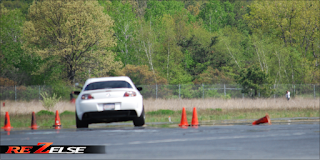 When going into a corner, the car will start to oversteer slightly, then understeer, followed by sudden oversteer. In transitions, the car will feel great and solid, but then will suddenly oversteer, instead of increasingly starting to slowly become more and more loose. It is as if the car cannot make up it's mind! Let's take a closer look into all the facts and see what we can come up with. Since last season, I've made some changes to the car. The RX-8 has lost roughly 50 lbs. overall, (with some more weight to lose! ), the OEM Togichi Fuji Super LSD Torsen-type rear differential was replaced with a Tomei T-Trax 1.5-way clutch type differential, and the race wheels and tires went up from 18x9.5 +45 with 255/35, to 18x10 +38 with 285/30. Naturally, a clutch type differential would require a change in your driving habits and some minor suspension adjustments, but not to the point in where it could be causing this much trouble I would think. 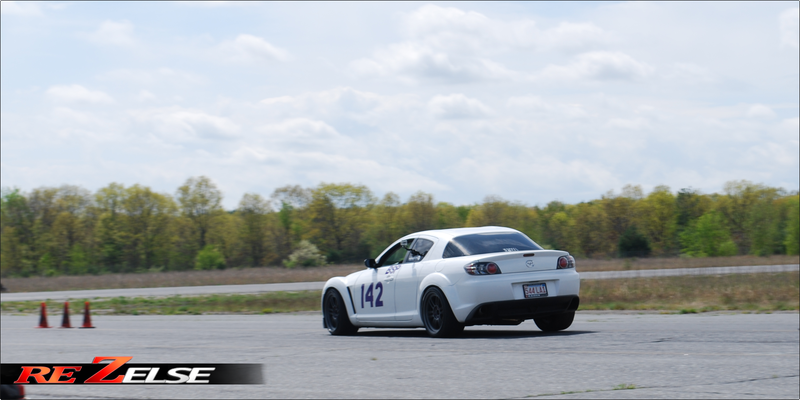 During the first few events, I kept the rear swaybar connected at soft setting and tried different shock settings. Doing this helped the car out a bit, but was more of a bandage in this case as it never really addressed the problem. The next approach was to lower the rear camber from -2.6 to -1.5. The issues still remained after this, but were not as exaggerated anymore. At this point, John and I agreed that regardless of the changes we have made, it feels as though the front does not have enough turn-in grip. 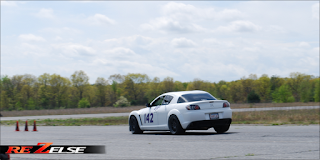 It was by the third SCCA NER event that John and I had some more insight as to what the problem could be, as I was fortunate enough to have had Lui take pictures of us out on the course. Based off the images you see in this post here, it looks as though I'm lifting the front and rear inside wheels. 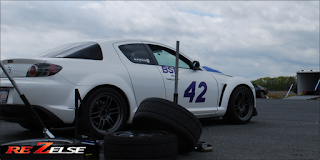 Lifting the inside rear makes it very hard to put the power down when exiting a corner or in a slalom due to the new differential, as all the power will go to the outside wheel and cause you to suddenly oversteer. My hunch is that I'm lifting the inside front and rear due to the more grip I have over last year. 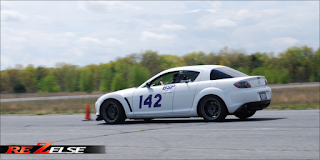 Last year, I was on the edge of lifting the inside wheels, but now that I have more grip and can corner harder and faster, I'm starting to go past the point of the wheels staying level with the ground. Lifting the inside front is not as much of a problem as lifting the inside rear however, especially if I am getting oversteer problems. John and I feel we should be able to get on the throttle sooner, but if we do, we start to slide. I can't help but also wonder if the delrin differential bushings are contributing a little bit to this, as last year's rubber bushings were starting to rip and had a lot of play in them. Lifting the inside rear even more! If the wheel lifts under braking: Less rear rebound damping, less rear sway bar, more front bump damping. Lifting the rear quite a bit? Now that we have more clues to the problem, we can start trying different things to address it before the National Tour in June. If we can get a bit more weight transfer to the front outside tire, it should help with our turn-in grip. If we reduce the front roll stiffness by setting the front swaybar (32mm) to medium stiffness, the car will oversteer with the current settings. To counter that, we will reduce rear stiffness at the same time by replacing my rear swaybar (19mm) to the stock swaybar (16mm) with polyurethane bushings. We are then going to do a few runs with the rear swaybar disconnected, and then connected. Softening the swaybars should solve some of the wheel lifting issues, which again, could be the root cause of all of this. If these changes don't help, increasing the rear spring rates up to 560 lbs. (10k) could be an option. I may also lower the front slightly so I can even out the front and rear height, but one change at a time. Fingers crossed that softening the swaybars does the trick! I don't see any wheel lift in those pictures. Weight has been unloaded from that specific tire, but it hasn't left the ground. Agreed, I don't see any actual lift there. I'm sure it is close to it and if it is that close you aren't able to put any good power down (it's to bad your front tires don't drive the car as well ;) ). I think you're on the right path though with softening up the rear sway, I just did the same thing for over-steer reasons. Sorry for the delay in responding here. So I was told it is lifting a bit higher than in the pictures here, these pictures are the best I have however. 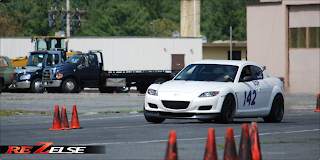 Renegade Miata First Points Event of 2012!